Metlakatla has traditionally been, and continues to be, dependent on marine environments for food, livelihood, and cultural practices. As a coastal community, Metlakatla members are participants in all aspects of the marine economy and work to maintain our aboriginal right to harvest for food, social, ceremonial and commercial purposes while conserving healthy, productive ecosystems. As the North Coast faces increasing pressures from industrial development, we are fully engaged in planning and decision making processes to ensure stewardship of our marine environment remains a priority, and our members remain active in the sustainable development of our resources. Metlakatla is currently working to produce a plan that incorporates the existing Marine Use Plan, as well as our Land Use Plan. Guided by a committee of community members, the plan will help inform stewardship and future marine development activities. To date, we have completed the necessary traditional, socio-economic, and ecological research needed to inform the plan. Once complete, Metlakatla will be guided by the plan as we engage in Government to Government discussions as part of the Pacific North Coast Integrated Management Area (PNCIMA)and Marine Plan Partnership (MaPP) planning initiatives to produce a comprehensive guiding document for the North Coast marine environment. You can find the Marine Use Planning Executive Summary here. 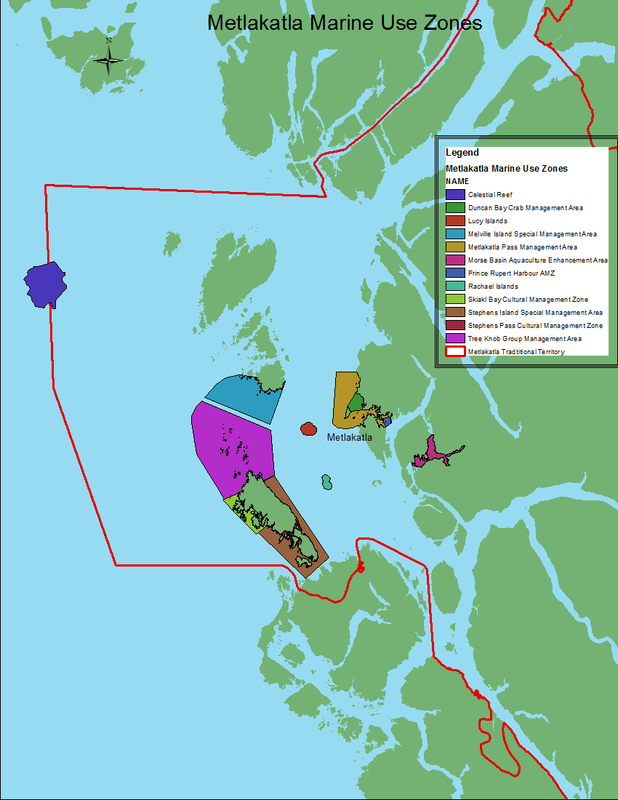 Metlakatla has categorized the territory into "Marine Use Zones" to help us designate appropriate uses for different areas within our Marine Use Plan.